A character of extreme importance to the ancient Inca , the chasqui was a messenger who also took care of a community's logistics. Chasquis were responsible of informing the emperors of possible uprisings or enemies approaching. Angel Franco details the image of a chasqui for this exquisite decorative vase. 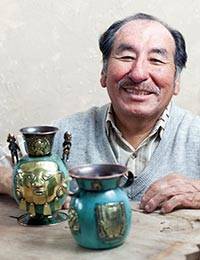 A llama stands proud on the other side of the vase’s belly as Franco works with galvanized bronze and copper. 16 cm H x 12 cm Diam.